An Act to provide for the constitution of a general police district embracing two or more Union territories and for the establishment of a police force therefor. The Act has been extended to Goa, Daman and Diu by Regulation 12 of 1962, Section 3 and Sch. Goa is now a State, see Act 18 of 1987, Section 3 (w.e.f. 30.5.1987) and to Pondicherry by Regulation 7 of 1963, Section 3 and Sch.I; Dadra and Nagar Haveli By Regulation 6 of 1963, Section 2 and Sch.I and Lakshadweep by Regulation 8 of 1965, Section 3 and Sch. 1. Short title, extent and commencement . (1) This Act may be called The Police Act , 1949. (2) It extends to all the [Union territories]. (3) It shall come into force in a [Union territory] on such date as the Central Government may, by notification in the Official Gazette, appoint in this behalf for such territory. 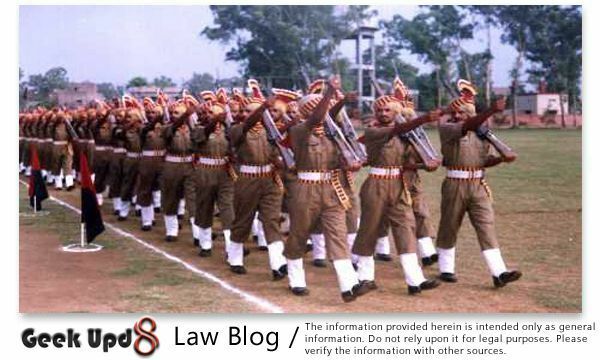 Statement Of Objects And Reasons - Each of the centrally-administered areas has, at present, as separate police force of its own.Ajmer-Merwara, the Andaman and Nicobar Islands, Coorg and Himachal Pradesh, whose police is in the process of reorganization, have separate cadres of both officers and men.Delhi has a separate cadre of head-constables and constables but a common cadre for Assistant Sub-Inspectors and higher ranks with the East Punjab.owing to the small areas and cadres, the police officers have perforce to continue in the same station or area for a long time and this position is not very satisfactory.To remedy this, it has become necessary to provide that Police Officers of Centrally-administered areas are transferred from one area to another according to the administrative exigencies by creating a common pool of officers and men which the Chief Commissioners' Provinces may draw upon, this reducing their dependence upon the Provincial Governments.This common pool of officers may also prove a useful source of supply to the Central Intelligence Bureau in the recruitment of its staff in the lower ranks.As the formation of a common cadre of officers for the police force in Chief Commissioner' Provinces involves the constitution of a single police force in all those Provinces under a single Inspector General, this object can be achieved only by enacting new legislation which may take the form either of an amendment to the Indian Police Act of 1861 or of an independent Act.The latter alternative is considered more suitable for the purpose. 2. Definition .In this Act general police district means the general police district constituted under section 3. 3. Constitution of general police district embracing two or more [Union territories]. .Notwithstanding anything contained in the Police Act, 1861 (5 of 1861), the Central Government may, by notification in the Official Gazette, constitute a general police district embracing two or more [Union territories]. 4. Constitution of one police force for general police district .The entire police establishment in a general police district shall be one police force and shall consist of such number of officers and men and shall be constituted in such manner as the Central Government may, by order, direct. 5. Superintendence and administration of police . (1) The superintendence of the police throughout a general police district shall vest in, and be exercised by, the Central Government. (2) The administration of the said police force shall vest in an officer, appointed in this behalf by the Central Government, who shall exercise in respect of that police force such of the powers exercisable by an Inspector-General of Police under the Police Act, 1861 (5 of 1861), as the Central Government may, by notification in the Official Gazette, specify in this behalf. 6. Application of the Police Act, 1861 .Save as otherwise expressly provided in this Act, the provisions of the Police Act, 1861 (5 of 1861), shall apply to the police force constituted for the general police district as if it were one police force constituted for a State, and members of the said police force shall have, in every part of [any territory] which is included in the general police district, the same powers, duties and privileges, and shall be subject to the same liabilities, as they would have had, or would have been subject to, as police officers if they had formed a police establishment under one State Government. 7. Saving .Nothing in this Act shall be deemed to affect the provisions contained in the Delhi Special Police Establishment Act, 1946 (25 of 1946).